Whether you're headed to an event or just want beautiful hair for your day-to-day, curling irons are highly useful styling tools for virtually any hair type. Thanks to the wide range of curling irons on the market, creating soft, bouncy curls or loose, relaxed waves has never been easier. Due to this range of options, however, finding the right tool to suit your specific hair type may seem like a tall order. That's why we've created this quick guide, which includes our picks for the three best curling irons available. There are a few key factors to consider when purchasing a curling iron. Curling irons are made out of different materials. A popular material is ceramic, which evenly conducts heat to provide a smooth styling experience. Ceramic curling irons minimize frizz and static and reduce heat damage across all hair types. Titanium curling irons heat up quickly and help hair retain moisture, which is important because excessive heat styling can cause hair to become dry and brittle. Some curling irons are plated with tourmaline. This technology produces negative ions, which are good for keeping hair healthy. These ions protect hair cuticles and lock moisture into hair to give locks a smooth luster. You'll also want to pay attention to the size of the curling iron's barrel. Different barrel sizes are better suited for different styles and hair types. Smaller barrels create smaller, tighter curls. Small barrels are also better suited for hair that is already curly to enhance definition. Medium barrels, while suitable for all hair types, are best for creating loose, beachy curls. Large barrels produce big and voluminous Hollywood waves. Curling irons with variable heat settings are best. With a range of heat settings, you can curl your hair at a lower temperature to reduce heat damage. Another convenient feature is a swivel cord to prevent pesky tangles as you're working the curling iron through your locks. A built-in auto-off feature is an added safety precaution. With this feature, you'll never have to worry about whether you left your curling on or not. Curling irons are available in a range of prices, from around $20 to upward of $50, depending on the material and features. Q. What's the difference between a curling iron and a curling wand? A. The more traditional curling iron has a clamp and is better suited for creating polished ringlets. It is used with the cord hanging down. Alternatively, a curling wand does not have a clamp, and it is used with the cord pointing up. Wands are ideal for creating natural-looking tousled waves. Q. Which barrel size is best for my hair length? A. A small barrel (0.5 to 0.75 inches) is best for hair that is above the shoulder. For medium to long hair, curling irons with a larger barrel (1.25 to 1.5 inches) are more suitable, and irons with elongated barrels style longer hair quicker. Our take: This easy-to-use curling iron produces curls that hold for multiple days while minimizing frizz. What we like: This iron has a comfortable handle and a speedy warm-up time. It also has easily adjustable heat settings, making it suitable for any hair type. What we dislike: It's pricier than other options. Our take: This curling wand works quickly and produces gorgeous waves. What we like: It features an easy-to-read digital screen on its base. This wand is a great choice for those looking to create relaxed waves. 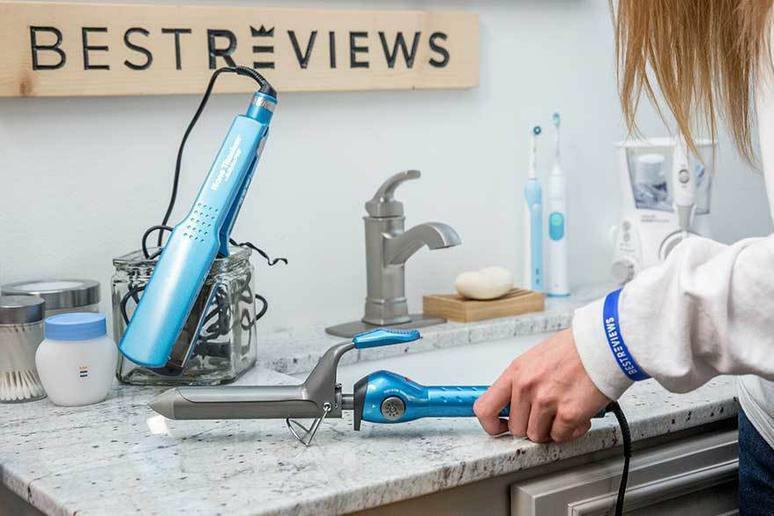 What we dislike: There may be a slight learning curve for users who are used to a more traditional curling iron with a clamp. Our take: This tourmaline ceramic curling iron provides a lot of control to make styling your hair a breeze. What we like: It heats up quickly and evenly. The auto-off feature is a handy safety measure. Good for all hair types, this iron creates soft, smooth curls that are free of frizz. What we dislike: Not much, though some owners have noted that the clamp is tight. Sara LeDuc is a writer for BestReviews. BestReviews is a product review company with a singular mission: to help simplify your purchasing decisions and save you time and money. BestReviews never accepts free products from manufacturers and purchases every product it reviews with its own funds.